Some great memories on the site. I was born in 1944 to Pearl Simms & Edward Kelly. We lived with my mother’s mother & father at 7, Victoria Street. Still have good memories of playing in the street, the pub over the road. I have a picture taken by the Citizen of all of us heading off to Weston-super-mare sometime about when I was 4 or 5. 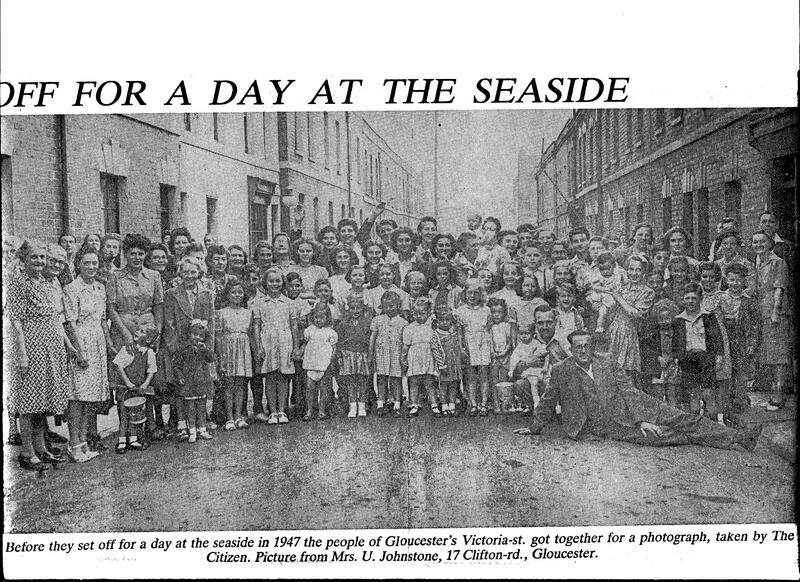 On the picture from Victoria street, my grandmother Gertrude Sims, is part hidden on the far left of the picture. 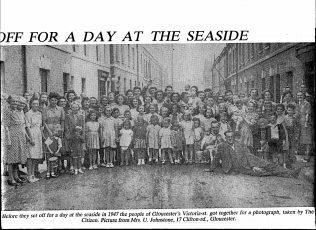 I am standing in front of my mother (Front row, 4th from the left),Pearl, (I am looking up & have a bucket & spade in hand). I want to Widden infants when a very young age as my grandfather was pretty ill. Stayed there until I went to the Central School in Derby Road then to the new School at the base of Robinswood hill. Remember my mother was great friends of Archie & Barbara Smith who owned an electrical shop on Barton street. There was a carpet shop owned by ? who had I believe played for Gloucester at Cricket, there was a bakery in the corner that had the most marvellous tasting dripping cakes, lots of sultana’s & one or two “Drippers” had disappeared by the time I got them home. A butchers on the corner of Victoria Street had a back entrance where they slaughtered the meat, & there was a lane by the pub to a pop factory. The Co-op had a shop down Victoria Street & remember getting a bag of broken biscuits & the ration cards. There was a lady who ran the off licence on the right hand side of Victoria Street & my Nan used to get me to go with a jug for some beer & two woodbines!! So many other memories vivid in my mind. I came by accident to the site. I live now for many years in Brisbane in Australia & get back regularly to the UK. By bus, train or hire car I head for Gloucester. To get my fix of “Drippers” now I can only find them in the bread shop in the square in the centre, which I remember as the bus station & where the bus station is now was the sheep & cattle market. Watched Colonel Carne march with the glorious Gloucester’s through the cross to the Cathedral on return from the Korean war with the small cross he carved. Thank you for allowing me the opportunity to say a few words. Hi I am looking for any information about the houses on Conduit Street particularly Tredworth Road end. I believe most of the houses were built by Mr Knowles and Mr Howard but cannot find any information what so ever. Any help would be greatly appreciated. It couldn’t have been Mr Coomer, Sadly the Gentleman committed suicide. Thank you for your comment Sandra. Just confirming that in the 1955 Kelly’s street Directory Charles Albert Beaman, grocer, is at no.64 Victoria St. Perhaps he and Prossers’ moved their premises at some point? At 1-30am this morning I woke up with a sudden realization of the name of the sports person I had known in Barton Street. I got onto my phone mobile & google & found out so much, I was amazed that he was not known. His name was Tom Goddard & google is alive with information, little did I know that he was one of the greatest bowlers of his time & an absolute legend. I think I told you I remember this immensely tall person. I really hope he is remembered in the Cricket circles of Gloucester, he deserves to be immortalised somehow, possibly at least his own page on your web site. http://en.wikipedia.org/wiki/Tom_Goddard so many more items but this sums it up & references his furniture shop. I spent ages going over the full book pages listed & really I had no idea of the great Gloucester history, from the Roman days forward. Looking at the street view of Barton Street on the google earth, I reckon the bakery was 158 Barton Street, & the furniture shop was at 154 or 156, or possibly both? Thanks for reminding me of Mrs Bolton, always in my mind as a kindly lady. The first 6 or 8 cottages in Victoria street on the left hand side entering from Barton street were wonderful old places with great gardens as I recall. My father was a great union supporter & remember going with him over the road from the church just after Victoria street to the ? , but it had a bowls rink at the front to pay the union dues for the workers at Rotol at Staverton, where I joined at 16 to do a 5 year apprenticeship with Dowty –Rotol. These are fantastic memories Roger thank you. Does anyone have any memories to add to those that Roger has shared here? In particular, can anyone confirm the name of the owner of the carpet shop, and whether he did play cricket for Gloucester? The 1955 Kelly’s trade Directory, held at Gloucestershire Archives, shows that Mrs L Bolton was the lady who ran the off licence. Benjamin Albert Coomber (at no.80) and John Wiliam Prosser (at no.96) were shopkeepers. Could either of these have been the proprietor of the carpet shop? Or was this shop not on Victoria St at all? You can view a larger image of the photograph above by clicking on it.